Think Fantastic Mr Fox meets cash play. All in a well-polished 25 pay line slot that pulls out all the stops to make itself appealing. The Foxin Wins Slot from NextGen Gaming is by far one of their most popular online slots with UK players. Boasting energetic gameplay, humour and dynamic 3D graphics. Foxin Wins puts the gloss on a bonus strong 5-reel platform that will impress those who play slots for real money. Set within the stately home of a rich, snobbish and bushy tailed aristocrat, Foxin Wins cordially invites real money slots players to the abode of one’s grand gold laden mansion. The video slot uses the NexGen Gaming 25 pay line 5-reel model. As well as some of the developers best-animated software to date with funny characters and bonus heavy routines working well together. Now one of the most popular UK slots played online. Foxin Wins charms with all the right moves including free games, super bets, random bonuses and a grateful gamble feature. There’s also a jackpot of 2000 coins and cash play from just 25p a spin. It’s a big advert for NextGen Gaming when their 3D graphics engine comes out to play and for good reason too. Foxin Wins looks spectacular and as a game has real depth. It’s also not boring, and that’s a major plus point. Too often these days online slots can seem run of the mill and tedious. In Foxin Wins, it’s the characters that help give the video slot its energy and charisma. In play and there’s Lord Fox, a chirpy Leprechaun and cute as cuddles Fox pups all playing their part to entertain. Whether in bonuses, on spins or between reel breaks, the game doesn’t let up and remains busy throughout. The animation is strong, user-controls well-placed and betting degrees are flexible. On playability value, the Foxin Wins Slot scores high thanks to plenty of character-play, bonus activity and a powerful super betting function. 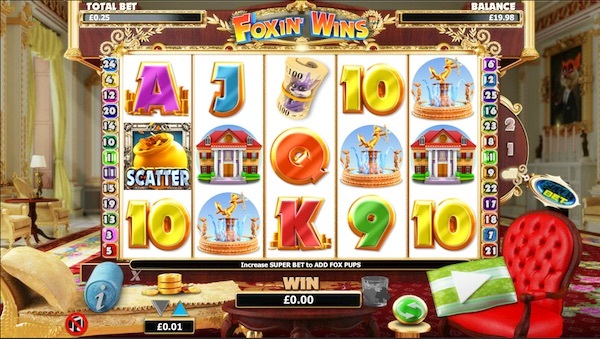 The Foxin Wins Slot Pay Table is formed using a two-tier system of both low and high paying reel symbols. Staying close to the aristocratic Fox theme, the slot uses finely polished card values of 9, 10, J, Q, K and A to represent the games low factor variants, but paying out 200 coins for 5 of a kind Aces, a Fox should not sniff at it. Moving up the Foxin Wins Payout Table, cash play casino players will no doubt be more interested in the bundle of money, valuable globe, Lord Fox’s Mansion and Mrs Fox’s Sports Car, these are the higher paying symbols worth up to 1000 coins. The Scatter is the lucrative leprechaun’s pot of gold, and the Foxin Wins Wild is Lord Fox himself, also the games jackpot worth 2000 coins. There’s a reason Foxin Wins is one of the most popular online slots in the UK. It’s the games features that give it that qualification. The Foxin Wins Slot uses an additional wager super bet, 10-free games round, random bonus games, Wilds and a gamble option on wins. If luck’s on your side, Foxin Wins can make a big difference. Especially during big wins and combos. First up, we’ll talk about NextGen Gaming’s Super Bet Feature and how it can increase winning combinations. But you’ll pay more on bets. The Foxin Wins Super Bet is an additional wager; you can either play standard with Super Bet off or with two different levels of Super Bet in play, 1 and 2. In standard play, you’ll spin the reels at 25 coins with Fox pups (Wilds) roaming in the third reel alone. Apply Super Bet Level 1 and it’s 35 coins a spin but with Fox pups in reels 2, 3 and 4. Super Bet Level 2 is all out war on cash play, costing 50 coins a spin but with possible Fox pups in all five reels. You’re effectively spreading your winning combo capability by releasing more Wilds in play. Nice touch! Next up, the Free Games Feature is awarded after the popular rule of 3 or more scatters (Pots of Gold). Find these Pots of Gold and ten free spins activate with the bonus of more recurring Fox pup Wilds during these free spins. What’s cool about this one is the fact that prizes get doubled during the Free Games Feature and that it “can” be re-triggered as well meaning up to 20 Foxin Wins Free Spins! The random bonuses cooked up by NextGen Gaming are equally compelling, and it’s their spontaneous outbreak that pitches the excitement. You could encounter one of these two random bonuses “Fox Funds” or “Leprechaun Shakedown” following a winning spin, and you’ll win the prize amount shown, note that during Leprechaun Shakedown, you’ll only win the prize if the Leprechaun gets caught by Lord Fox and shaken down. You could win up to 100x your triggering bet. Foxin Wins has a gamble feature too, increasing the cash play incentive by doubling and even quadrupling wins by up to five times. Now you can see why real money slots players love Foxin Wins. Our bushy tailed aristocrat Fox covers the entire betting margin and although you wouldn’t consider maximum bets high-roller territory, Super Bet Level 2 offers betting stakes that even high rollers would consider purposeful. It’s a 25 pay line slot, and that’s fixed pay lines, so although coin values are variable, you will always bet 25 pay lines in a cash play casino. Depending on whether or not you are using Super Bets etc., spins on Foxin Wins cost from just 25p to £100 as a maximum bet. The payout rate is 95.3% RTP with a jackpot of 2000 coins. In stunning 3D and with the graphics that turn most online slots green with envy, Foxin Wins is a cash play slots triumph for NextGen Gaming that delivers on all fronts. Not only does it look good, but it gives real money slots players more control by pushing the boundaries of bets to the limit if they want to. It’s also funny, has character and maintains playability thanks to cleverly crafted bonus innovations. If you want to know why Foxin Wins is a popular UK slot choice, consider the free games, super bet functionality, Wild fox pup invasions, extra gamble options and one of two super cool and funny bonus games that could just happen at random. That’s why, and Lord Fox will prove it too!